Chilli and chocolate – a classic combination which still takes many by surprise. In this recipe I’ve used a whole, dried Pasilla chilli which I’ve deseeds and soaked in boiling water for 5 minutes to dehydrate. The Pasilla is a rich, fruity chilli with an earthy, almost tobacco-like smokiness. It adds some great depth and complements the chocolate really well, but doesn’t provide a lot of heat, so I’ve also added about 1/2 tsp thai chilli flakes. These are really hot, and as I’m getting to the bottom of the jar, are more like powder than flakes so dissipate well throughout the loaf. You can use any chilli combinations you like, and adjust the quantities to meet your taste. Dried cayenne type chillies are a good place to start. As far as the chocolate s concerned, the usual rules apply – go for the best you can find. 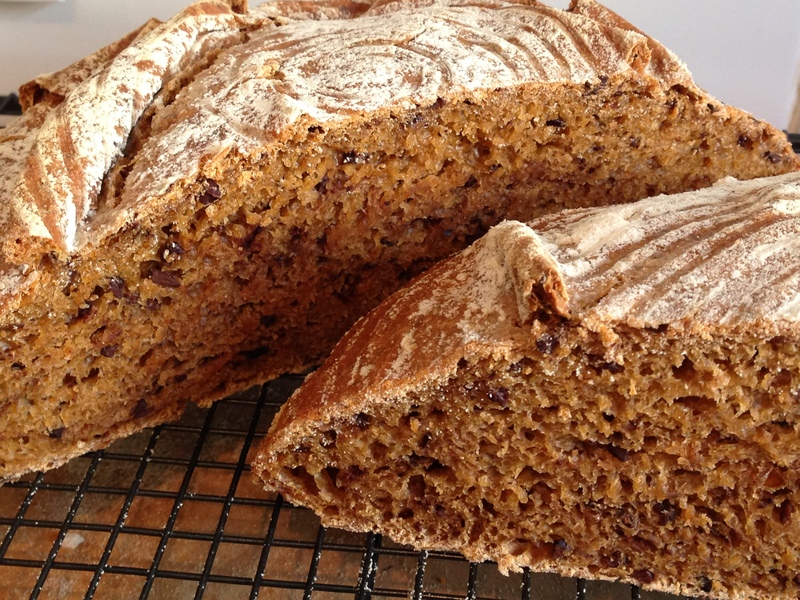 A high cocoa content tends to give a rich, bitter flavour which is exactly what this bread needs. I’ve also added an equal quantity of cocoa nibs (unprocessed cocoa beans), which add a bit of a crunch. If you can’t get hold of these, double up in the dark chocolate. You don’t want big chunks of chocolate – this isn’t supposed to be a chic-chip cookie. I make chocolate shavings using a vegetable peeler, which gives good, discrete flakes rather than grating which can encourage the chocolate to melt into the dough. Aside: You’ll notice the ‘arty’ effect on the top of the loaf ofter proving. It looks like the bread is being unwrapped, and is due entirely to the fact that the loaf stuck to the banneton in 2 small places, tearing the fine skin that formed over the surface. This was partially due to the lack of flour int he banneton, and partially due to the extended proving time, which gave a chance for the moisture in the loaf to penetrate. It didn’t spoil the bread, but did impact it’s shape at a point in the process where it couldn’t easily be recovered. All the same, it tasted great! Turn the dough out onto lightly floured surface and knock back. Fold over a couple of times and form into a neat round. The dough needs to prove for an extended period (both to develop the flavours and to ensure that the sourdough has time to work). Proving in a banneton is a good idea, but you could use a tin or bowl. I have nominated you for a A Most Inspiring blogging award, but because i’m such a luddite you may not have got the ping back!